Please fill or choose the data marked red and try submitting again. The expected result is 0.236 of a fringe shift. Test other values to see how they might affect the outcome. 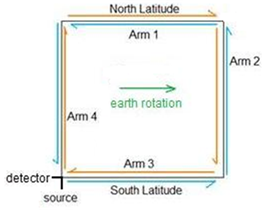 For example, the maximum fringe shift is at 90 degrees latitude, whereas at the equator, the shift would be zero.